New Delhi : Indian classical musician and Sarod maestro Ustad Amjad Ali Khan who awarded India's second highest civilian honor, the Padma Vibhushan, in 2001, on Friday, wishes Merry Christmas in his own unique style. Sitting near a decorated Christmas tree, the maestro renders a beautiful rendition of 'Jingle Bells' on the sarod. Jingle all the way... Oh, what fun it is to ride, In a one horse open sleigh.... AND this is the way we do in our special style on the ‪#‎sarod‬ !! Experimented with something different in the spirit of ‪#‎Christmas‬....Merry ‪#‎Xmas‬ ! 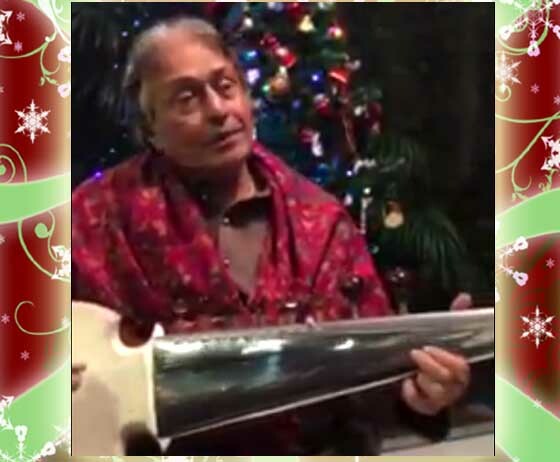 ‪#‎MerryChristmas‬"
The award winning musician plays the beginning of the famous carol and not even once does it sound odd to hear it on an instrument like Sarod. Its simple and deeply soulful. Khan received the Padma Shri in 1975, the Padma Bhushan in 1991, and the Padma Vibhushan in 2001, and was awarded the Sangeet Natak Akademi Award for 1989 and the Sangeet Natak Akademi Fellowship for 2011.